THE SPEYSIDE WAY. 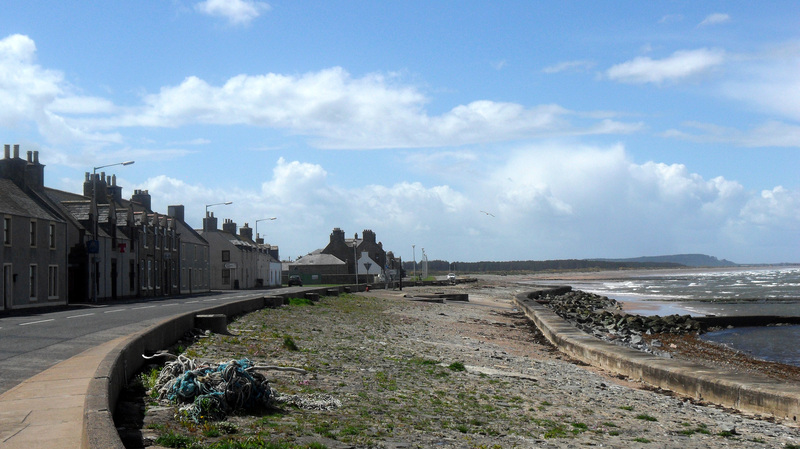 Fochabers – Buckie. The weather has changed again and this morning there is a bitter north wind with heavy showers forecast. We walk down to the banks of the Spey and then along under a new bypass – which explains why the town was quiet last night. 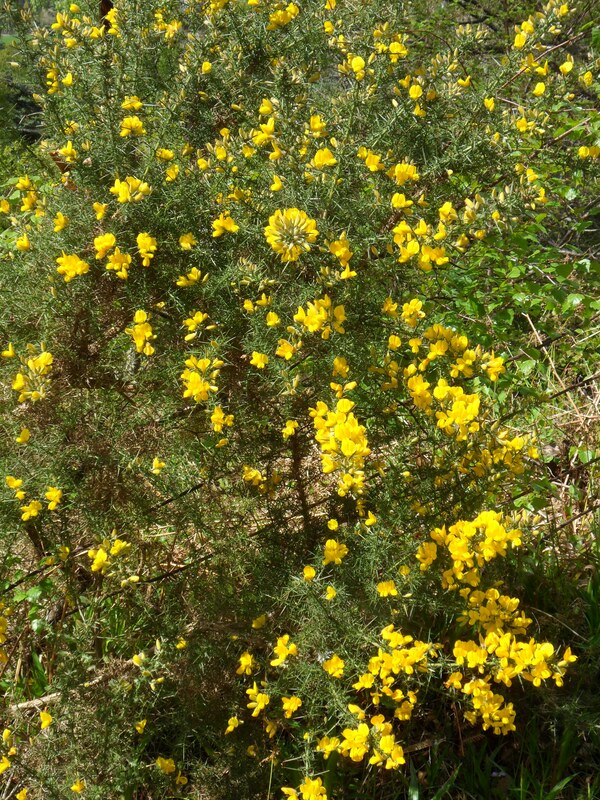 Continuing through mixed woodlands with gorse and broom in flower made for pleasant progress. 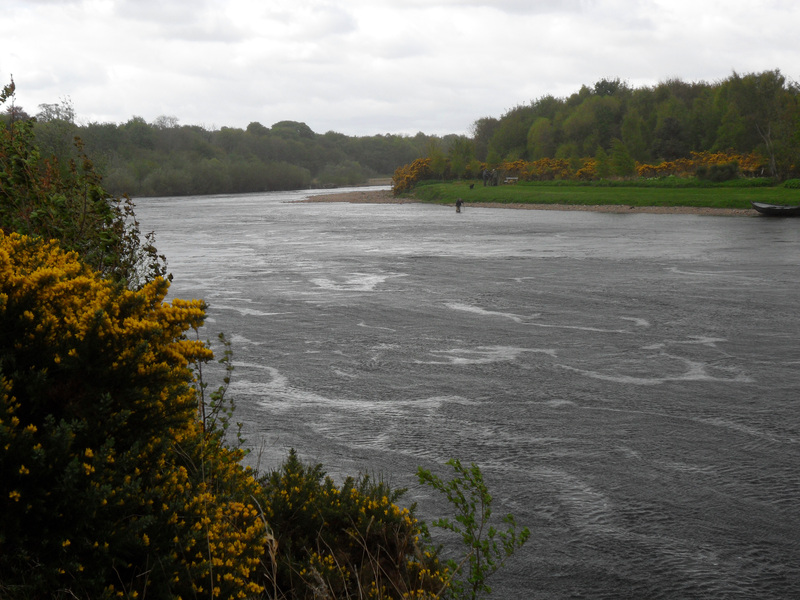 There were glimpses of the river in full flow with the persistent fly fishermen. You never see a woman participating in this sport. 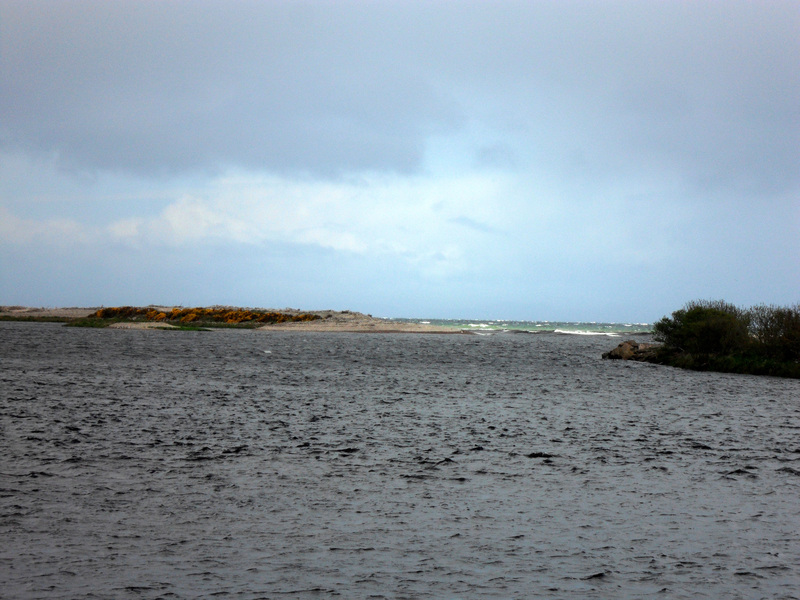 Heavy sleety showers passed quickly through and eventually we came out at the shingly mouth of the Spey. In 1768 a salmon fishing station was built here. The large Tugnet Ice House  still remains. Only a third shows above ground level. Ice was gathered in winter and stored in the ice house to keep the salmon fresh. 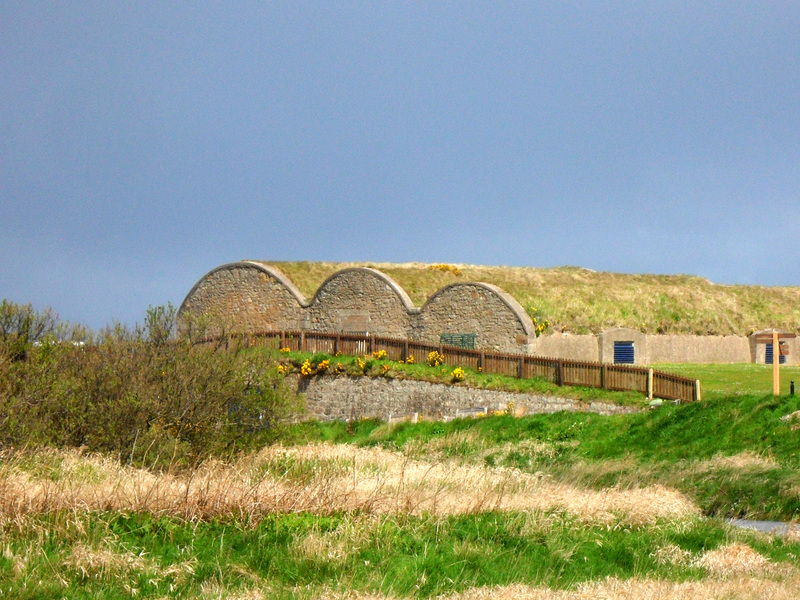 The buildings have been converted to be used as The Moray Firth wildlife and dolphin centre. 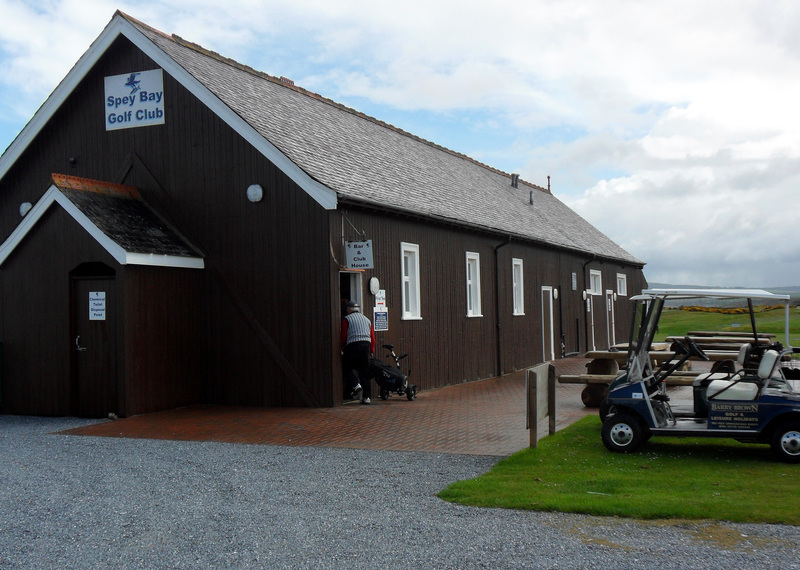 We didn’t have time for any dolphin watching and the next storm was blowing in so we headed to the Spey Bay golf links and their welcoming clubhouse/cafe. The near by hotel has closed but we were able to enjoy a coffee here and listen to the banter of the golfers who were not in a rush to set forth in the rain and wind. 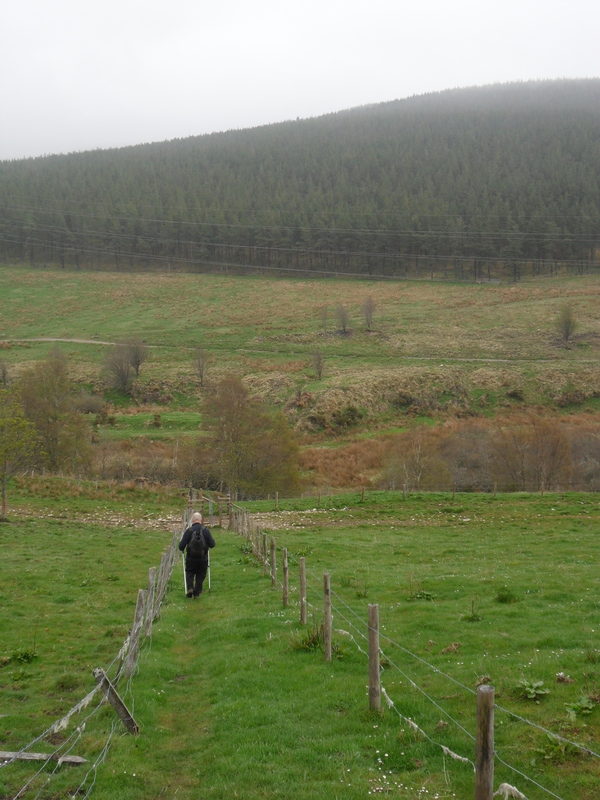 Braving the weather we continued, the Speyside Way now taking the same route as the Moray Coast Trail. 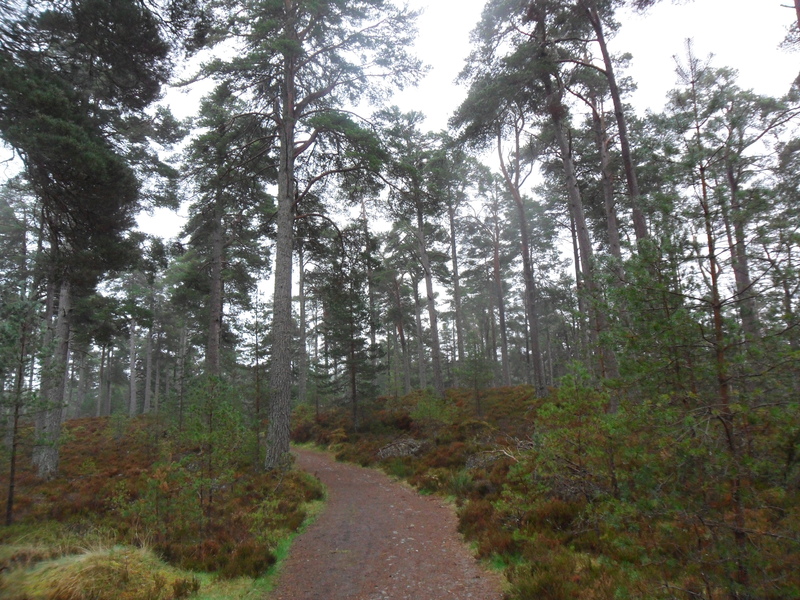 For three miles we were in the sheltered woods just inland of the links so had no view of the sea. The last of those damn metal squeeze traps was passed. 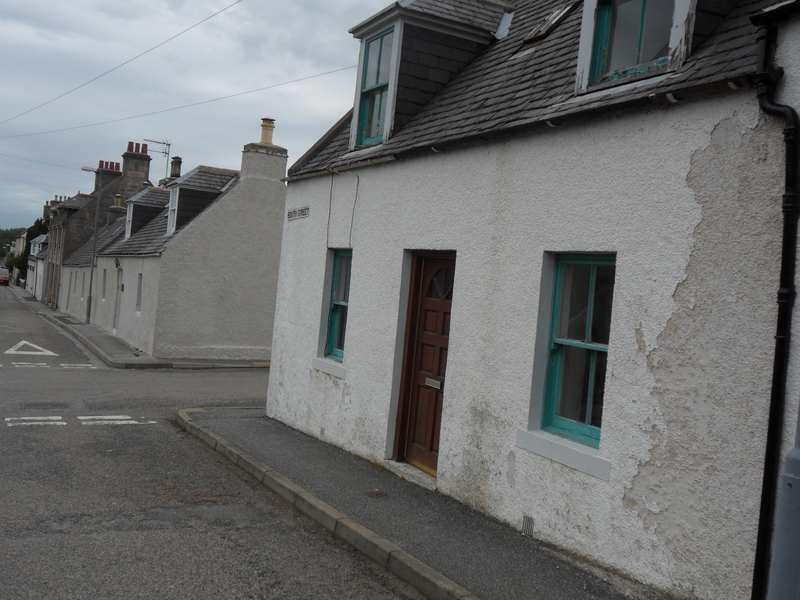 We emerged at the small harbour village of Portgordon looking rather bleak in today’s weather. Amazingly in this run down place we came across the small Lennox Inn and enjoyed a pint in the tiny cosy bar. The landlady was only too pleased to chat, took us back a few decades in time. 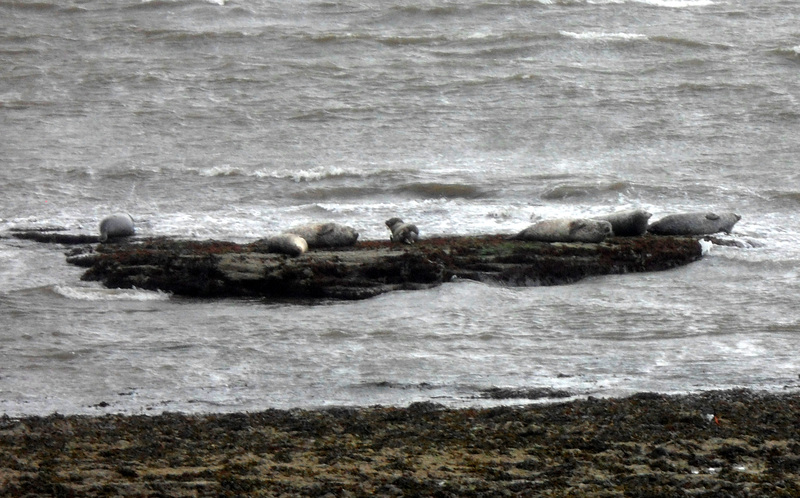 A little further along the coast we had a view of seals basking on a rock just offshore. Maybe because of the beer we managed to loose our way in the gorse bushes around the next golf course but eventually arrived at the harbour of Buckpool which was the end [or beginning] of The Speyside Way. This seemed a little unsatisfactory leaving us to wander through streets for another mile into the unpretentious town centre of Buckie. Would have been preferable to continue on the coast to Buckie harbour and then up to the centre. All that remained was to catch the bus into Inverness for the night and the traditional end of walk curry. Oh and the long train journey home the next day. 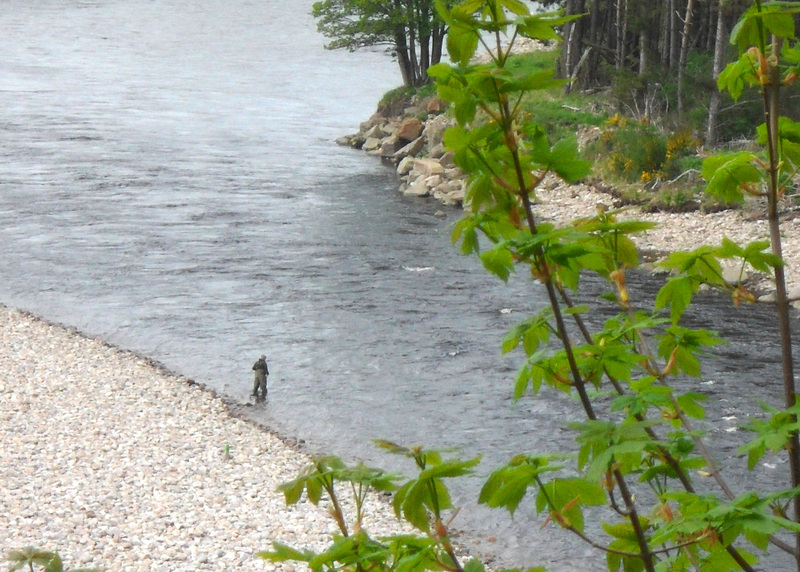 So I would highly recommend The Speyside Way. It has given us six days varied walking through grand scenery. There were lots of interesting diversions along the way, we met some lovely friendly people and enjoyed the wildlife. It gave me a good chance to catch up with my old mate and we probably both put on a few extra pounds! I look forward to our next annual hike. 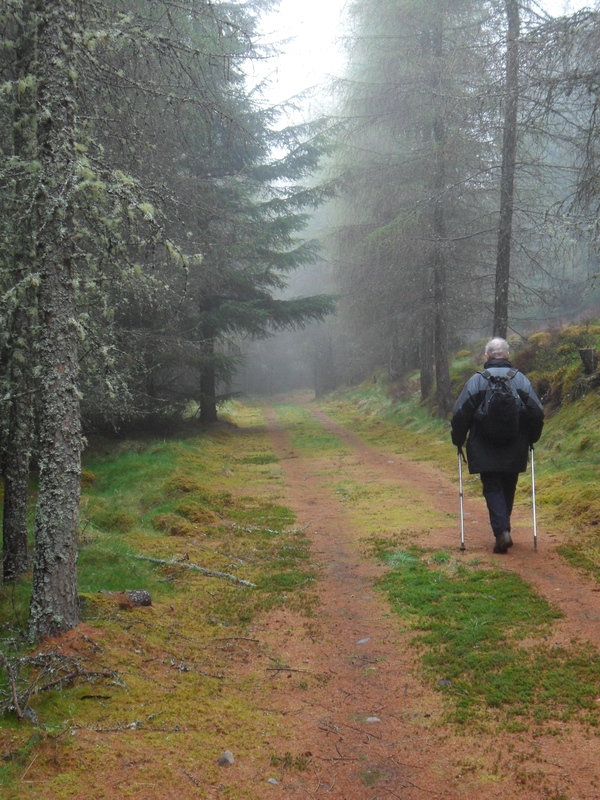 This entry was posted in Long Distance Walks., Speyside Way, Walking. and tagged Long Distance Walks, Walking. on May 29, 2013 by bowlandclimber. THE SPEYSIDE WAY. 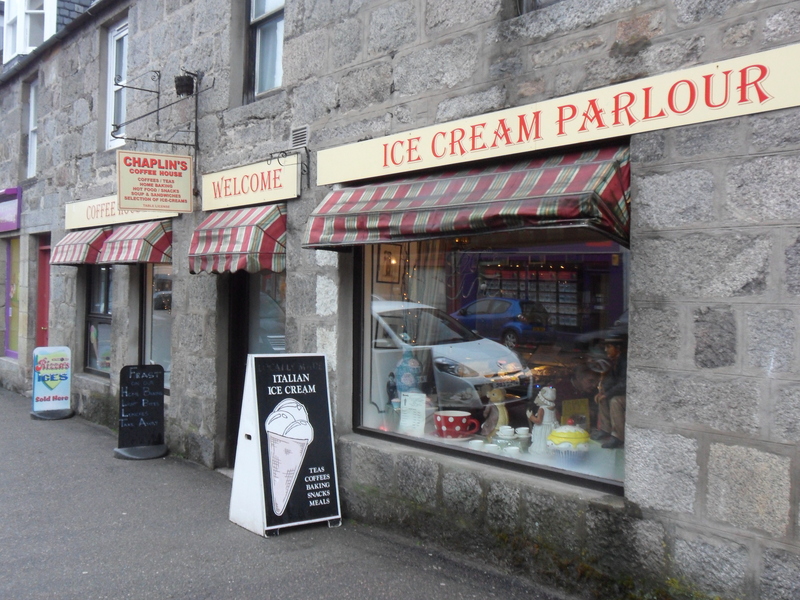 Craigellachie – Fochabers. The day was much brighter with some blue sky showing through the previous grey clag. 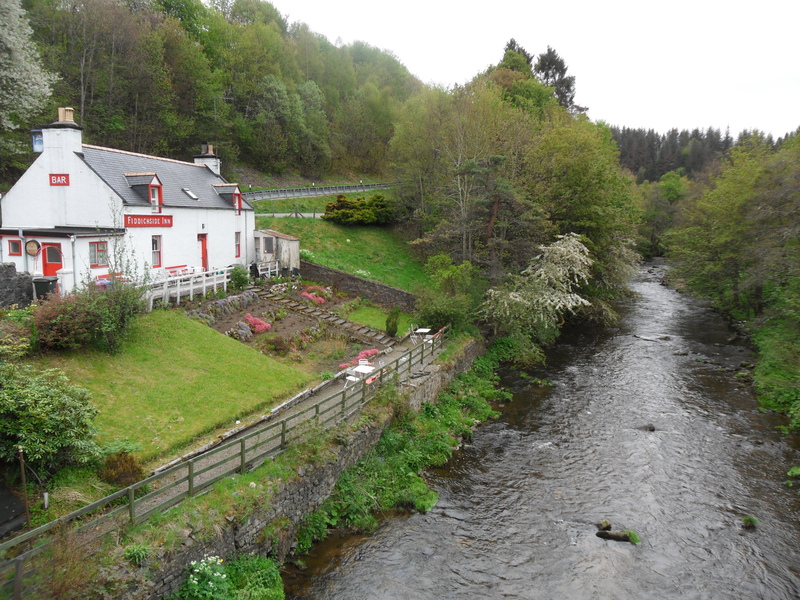 A short stretch of old railway bridge over the River Fiddich and an old inn on its banks. By all accounts this is an unique place steeped in the past, wish we had had the foresight to visit last night before supper. 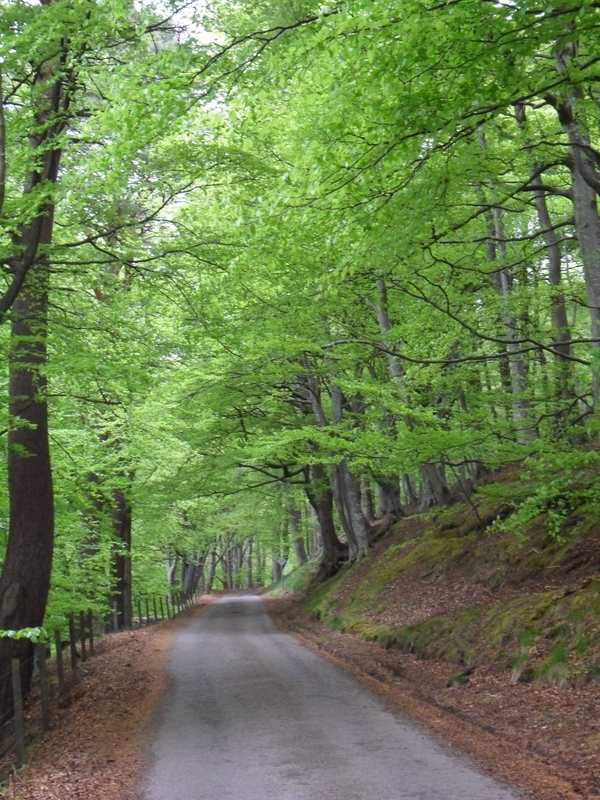 We were now walking on a minor road into the Ben Aigan forest. We slowly were gaining height in a beautiful woodland setting. The gradient was so gentle that we reached the highest point on the Way before we even realised, having expected a tough ascent. There were views down the Spey northwards to road and rail bridges at Boat of Brig, we would arrive here an hour later. The Moray Firth was also visible and can just be made out at the top of the photo if you click to enlarge. Lots of walkers were met coming the other way, the characteristic mid way rush hour. The route was very undulating from here on and we didn’t see a soul on this section of minor road. At one high point there were rather restricted views back south to the snowy Grampians from where we had come. The gorse was in full bloom on this stretch. 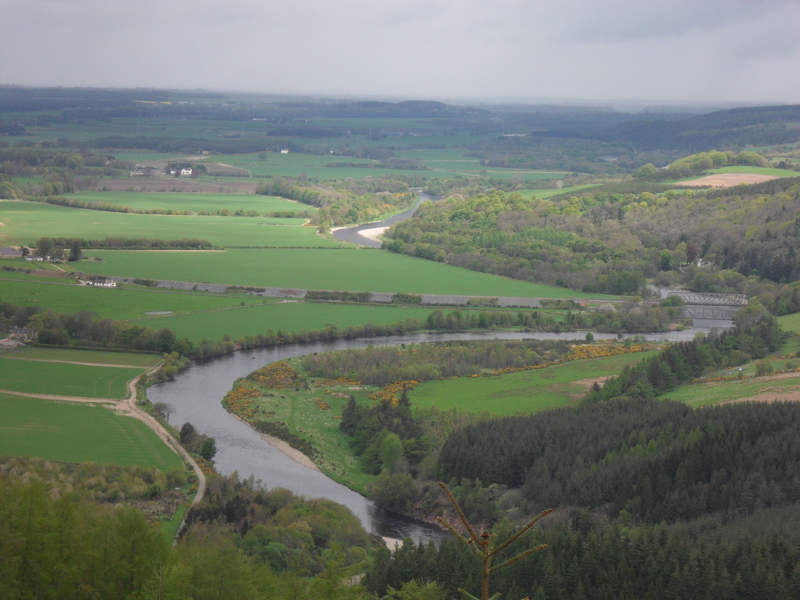 We diverted to a high view point over the River Spey. There were men stood in the river up to their thighs with a stick and line. Apparently they pay up to a thousand pounds a day for this! And I thought long distance walkers were verging on madness. 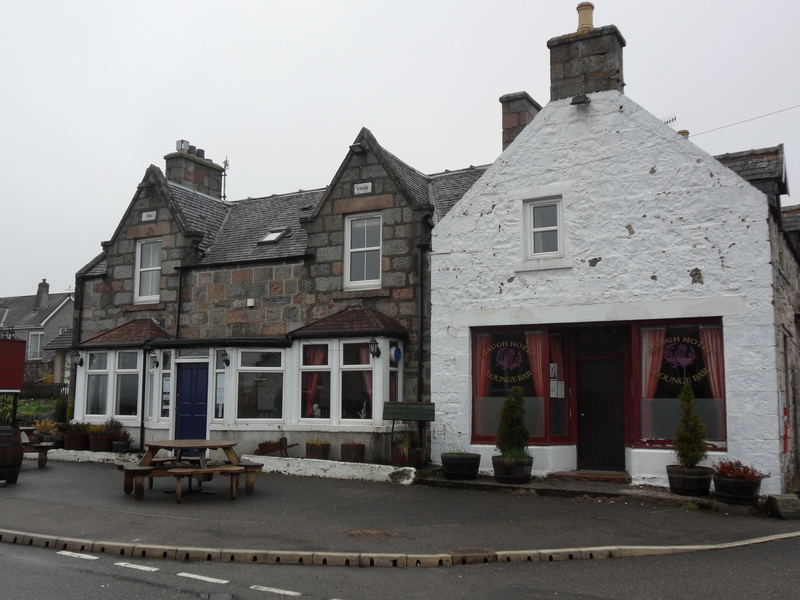 We eventually arrived in the sturdy, granite constructed, traditional village of Fochabers. A no nonsense B&B and a no nonsense fish and chip shop were our delight followed by a couple of pints in a no nonsense inn. 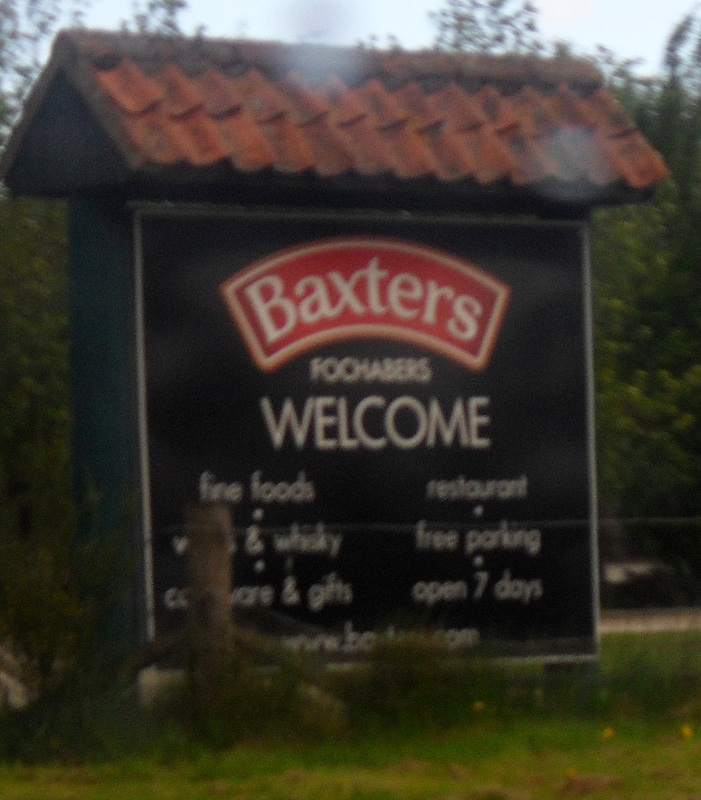 Fochabers is the home of the Baxters food company, of the Royal Game Soup fame. As I was walking with a Baxter had hoped to get a photo of him outside the factory. Unfortunately it was well off route! 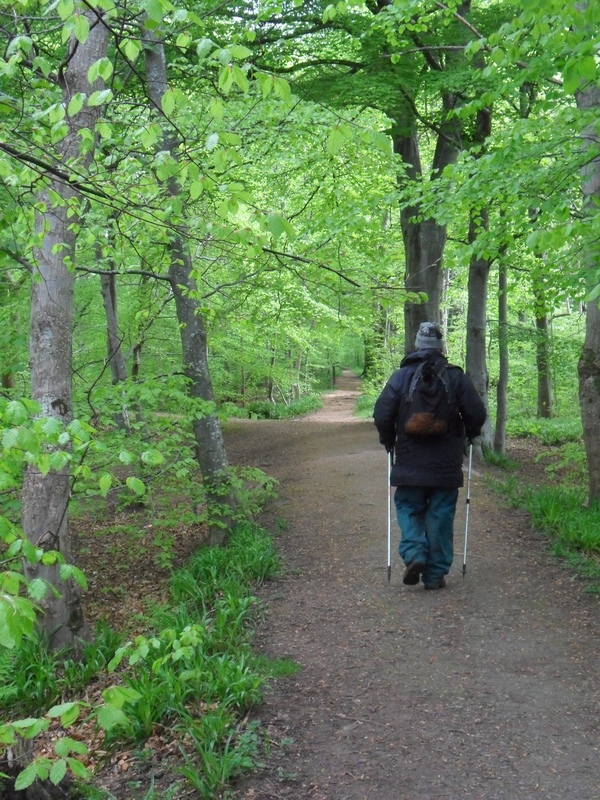 This entry was posted in Long Distance Walks., Speyside Way, Walking. and tagged Long Distance Walks, Walking. on May 28, 2013 by bowlandclimber. THE SPEYSIDE WAY. Ballindalloch – Craigellachie. 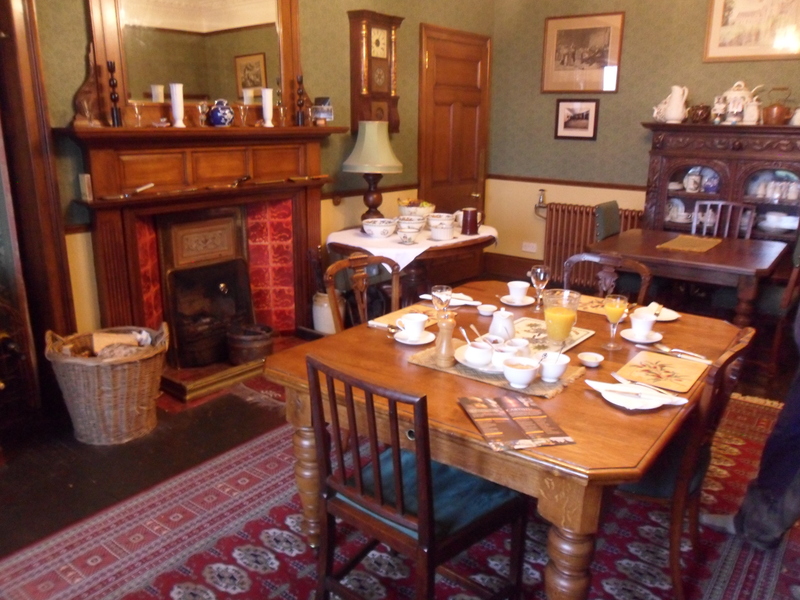 By having an early breakfast we were able to book onto the first tour of the morning in the nearby Cragganmore Distillery. We were the only two so had a private trip with guide. This is only a small outfit and we got to see, and smell, all of the processes at close hand. 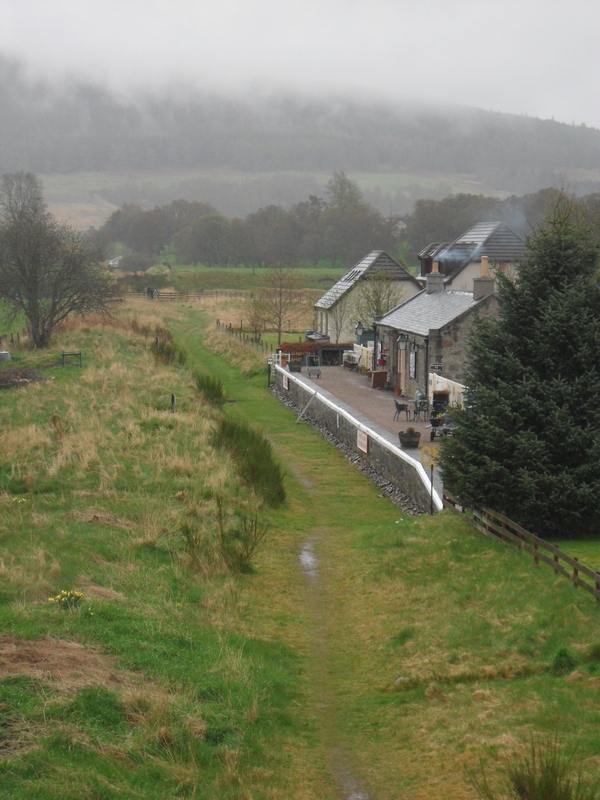 The distillery was set up in 1869 to take advantage of the Craggan Burn and the nearby railway. 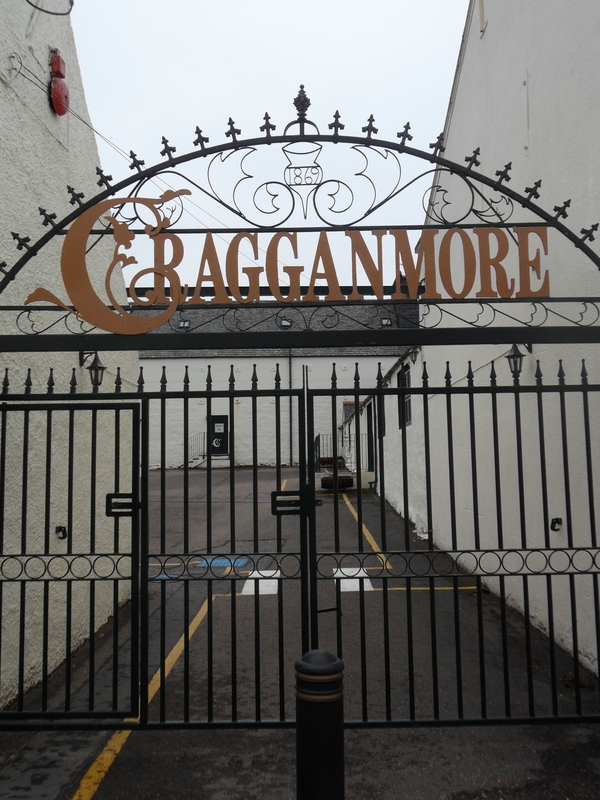 Cragganmore Single Malt is one of the most complex Speyside Malts. 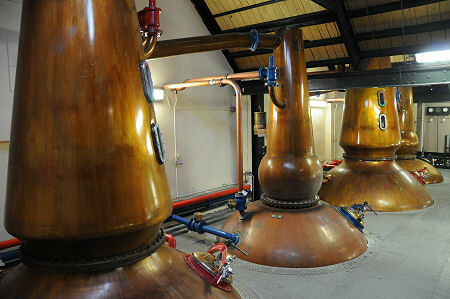 The distillery’s unique flat topped spirit stills and the slow condensation in traditional worm tubs, promotes Cragganmore’s complexity. The whisky is stored in either Bourbon casks imported from the states or Sherry/Port casks – each giving a different taste. There were vast bonded warehouse spaces filled with aging casks, quite a sight. The whole process from mash to spirit is now computerised and can be virtually run by one man from a central console! At the end of the tour we got to sample two of their single malts and as we were the only ones a couple of other malts as well. Unusual to start a days walking fueled by whisky. The day continued with a whisky theme as the walk followed the Speyside railway for 10miles past several other distilleries and their abandoned halts. Speyside has the greatest number of distilleries of any whisky producing area. 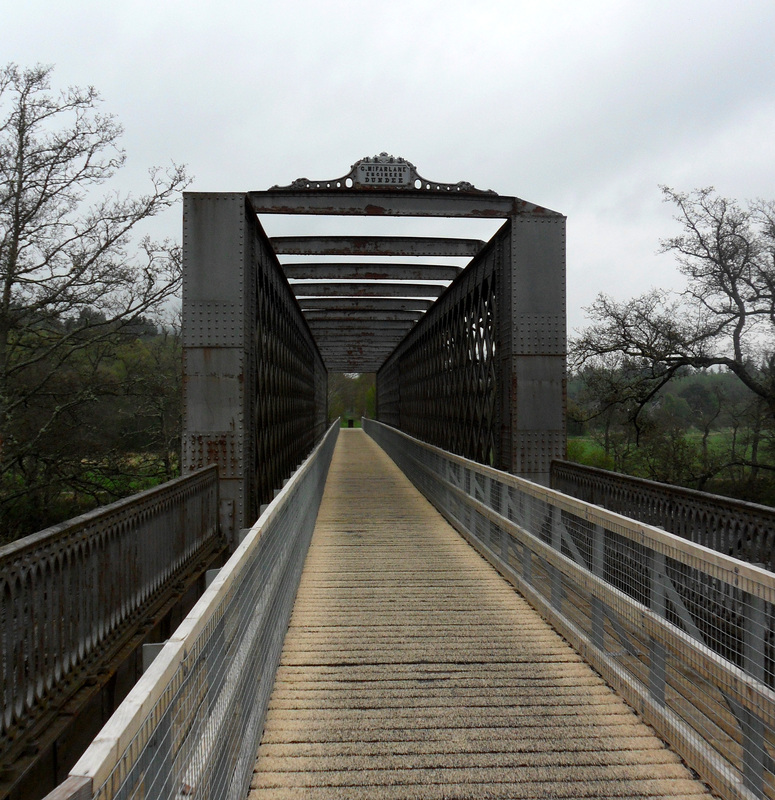 First we crossed the Spey itself on the iron girdered railway bridge. At the far end we were awarded the sight of a red squirrel in a nearby tree – giving a good photo opportunity. 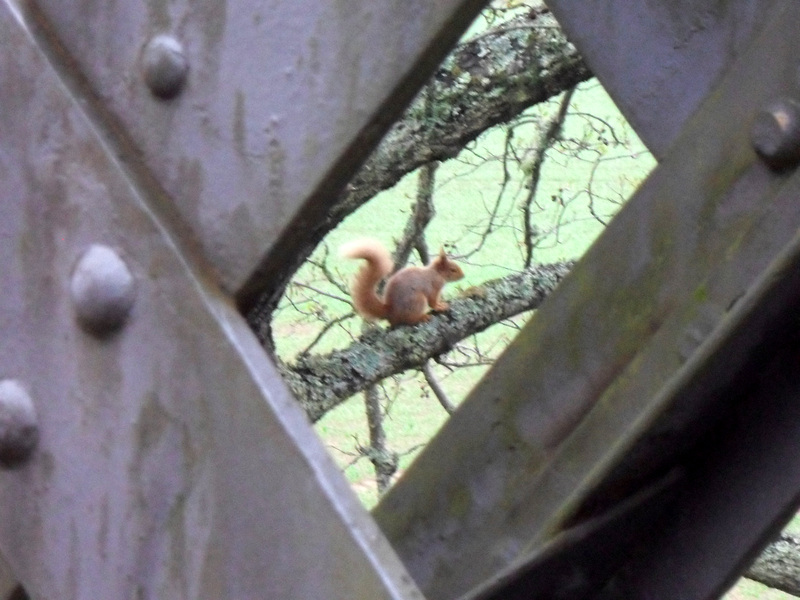 We in fact saw red squirrels most days of the walk so hopefully they are thriving up here. Easy walking gave us fast progress with the river close at hand. 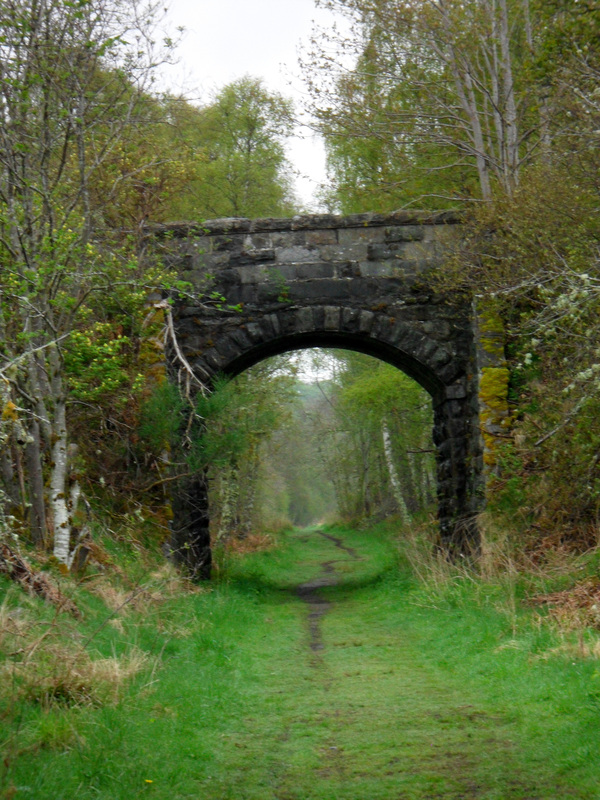 Several other way walkers were encountered and the abandoned line was popular with cyclists. Abandoned railways can often become monotonous to walk along but somehow today had plenty of interest. Eventually we arrived in the pleasant small town of Aberlour for afternoon coffee and then the last couple of miles along the Spey to the even smaller Craigellachie. This consists of a distillery, a handful of houses and two hotels. We were staying in The Highlander the more modest of the two. Greeted by a Chinese girl with blue hair! Also serving on were a Thai and a Dutch girl. What’s going on? Not a Scot’s accent in the place which is renowned for its collection of malts in the bar. They have over 400 different malts which is nothing compared to the hotel across the road which has 750! The Whisky ‘menu’ was a volume in itself, I restricted myself to sampling the malts from the local distillery in the village. 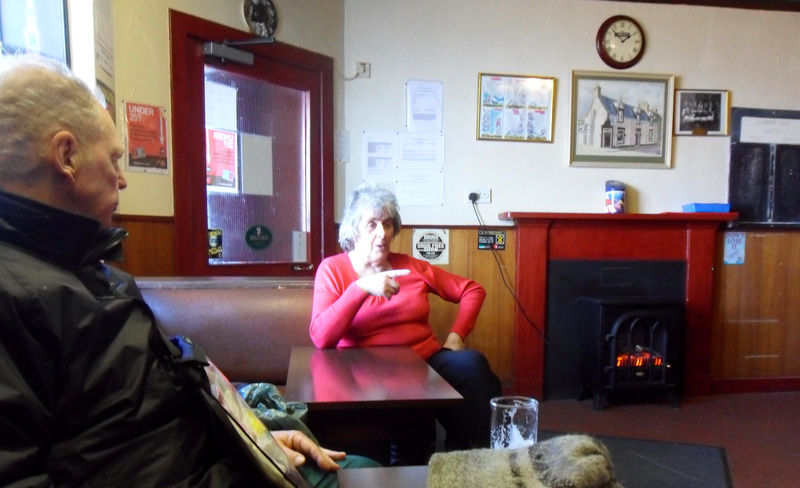 Everyone in the bar were enjoying themselves and all seemed very knowledgeable about the whisky, particularly the large number of German visitors. THE SPEYSIDE WAY. 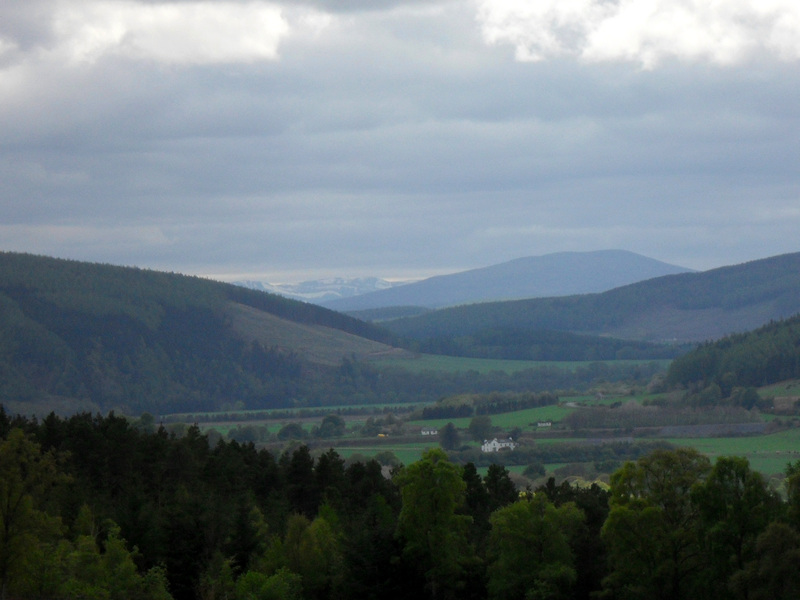 Cromdale – Ballindalloch. Again a dull morning but enlivened by a great breakfast served by the lad who is a highland marathon champion. I bet he has porridge. Off again along the railway and soon into a gull colony where we attacked by the BIRDS. 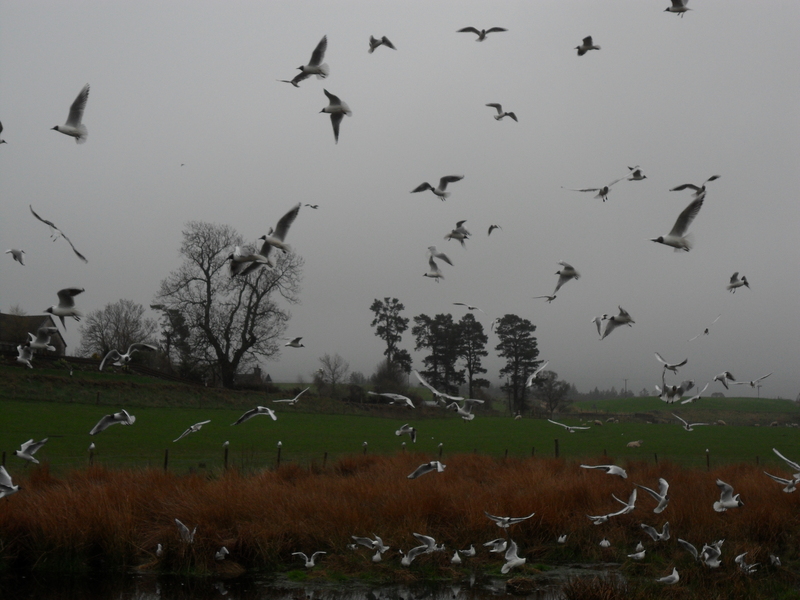 Black Headed Gulls. No damage. For a couple of miles it was easy going on the old track but then suddenly we were faced with steep ascents into the forest. With the mist down the woods took on an aerie atmosphere. The undulating route took us out of the woods and up onto a ridge which would have given us views back to the Cairngorms if it had been clear. We met a man going in the opposite direction who was 77 and recovering from a hip replacement – impressive. The ground was rather difficult being boggy and bouldery so we made slow progress. The days walk was characterized by the style of stile on route. A sort of squeeze stile updated into a springing metal trap. Must have passed through a hundred of these today. 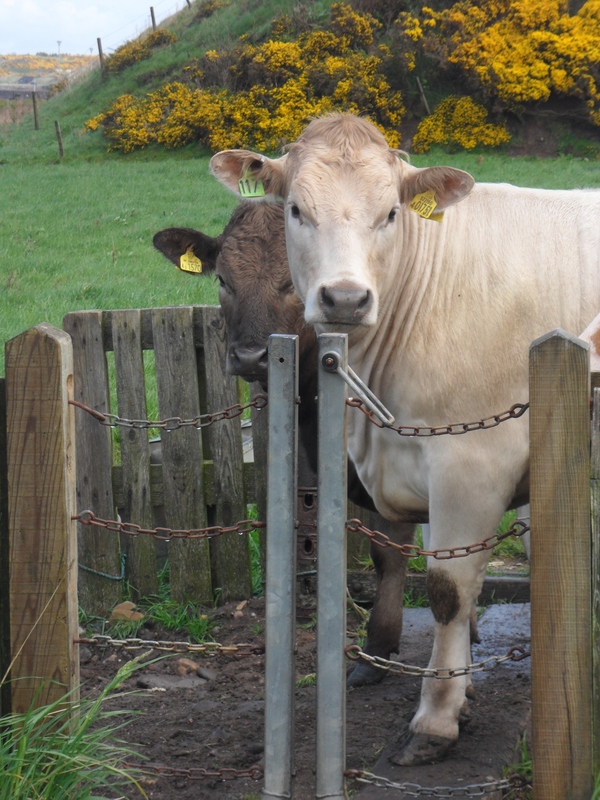 We were often fenced in by barbed wire, to separate us from the cattle, but it was not a good walking experience. The woods we traveled through were heavily encrusted with lichens which gave an added aspect to the scenery. 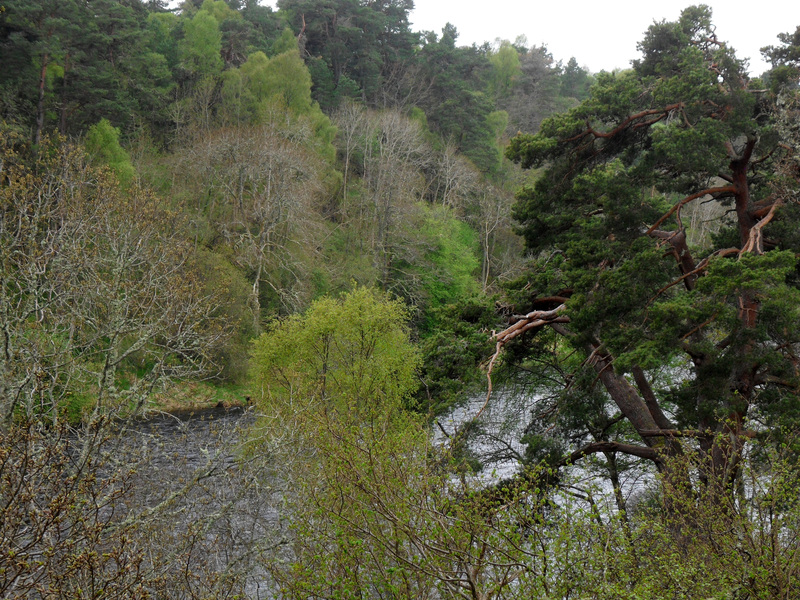 Eventually we dropped down to the old railway by the Spey for the last couple of miles to our Ballindalloch B&B – Cragganmore House. 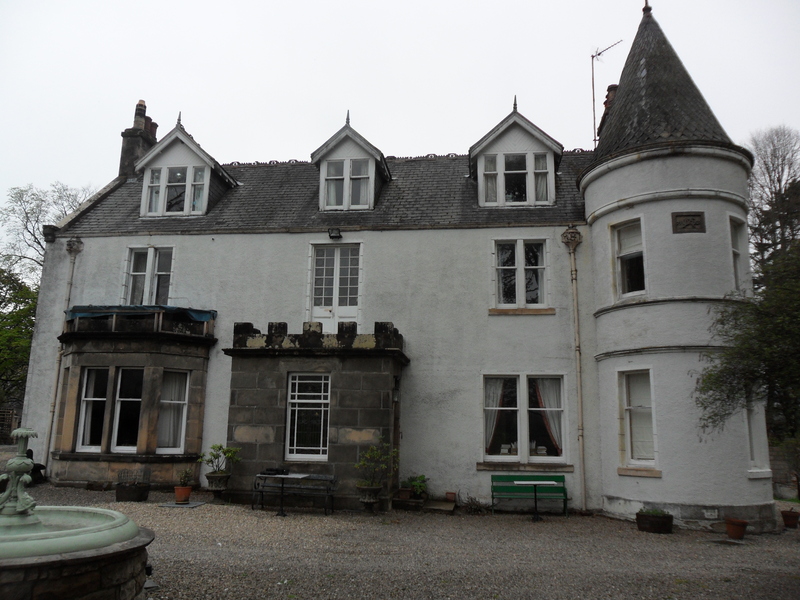 this large house had been the property of the founder of the close by Distillery back in the 1860s. the present owners have furnished in a period style making it popular with visiting tourists. We thought the £32 evening meal a little pricey so survived on cup-a-soups and biscuits in our room. Very peaceful night in the middle of nowhere. 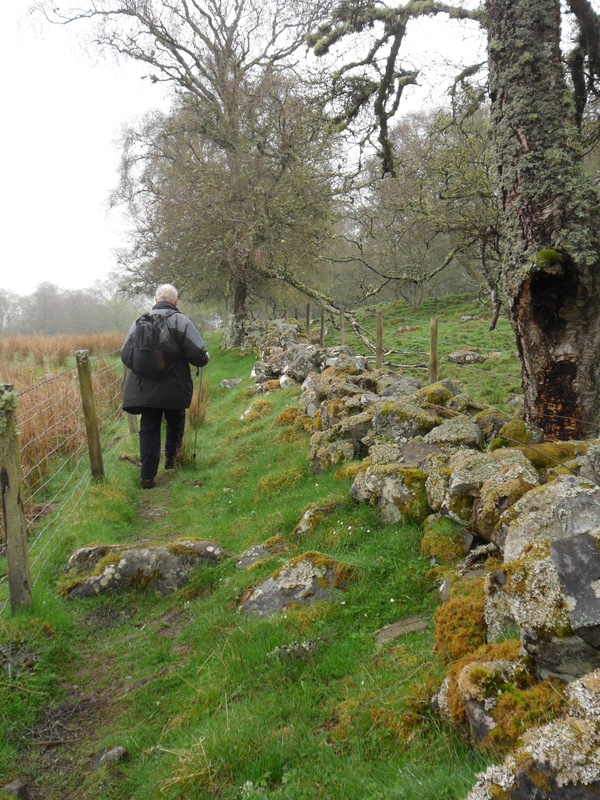 This entry was posted in Long Distance Walks., Speyside Way, Walking. and tagged Long Distance Walks, Walking. on May 27, 2013 by bowlandclimber. THE SPEYSIDE WAY. 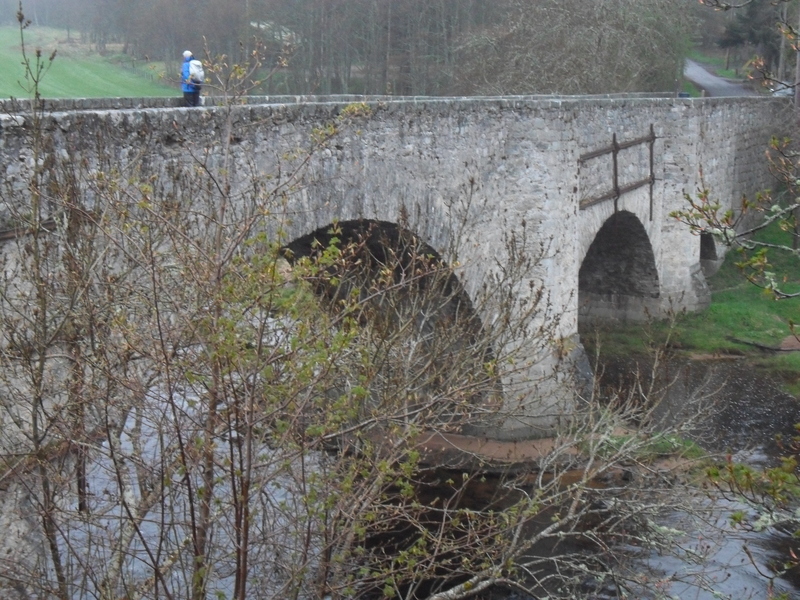 Nethy Bridge – Cromdale. It rained all night. The superb breakfast was enhanced by the tales from the three crazy bird watchers . The whole region is busy with twitchers hoping to see the Osprey and the Capercaillie. Suitably fortified we wandered down beside the River Nethy to join the old Speyside Railway. 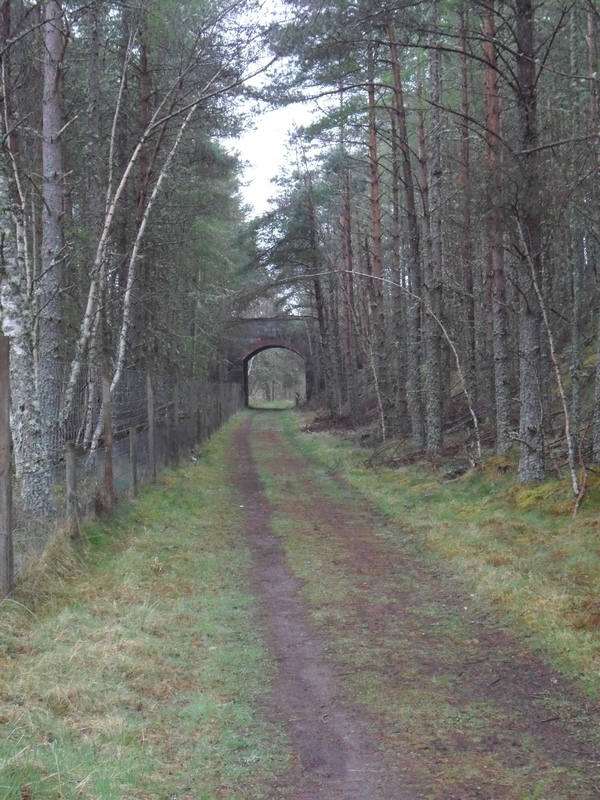 This section of the railway has not been reopened although the enthusiasts would like to extend the steam route to Grantown. 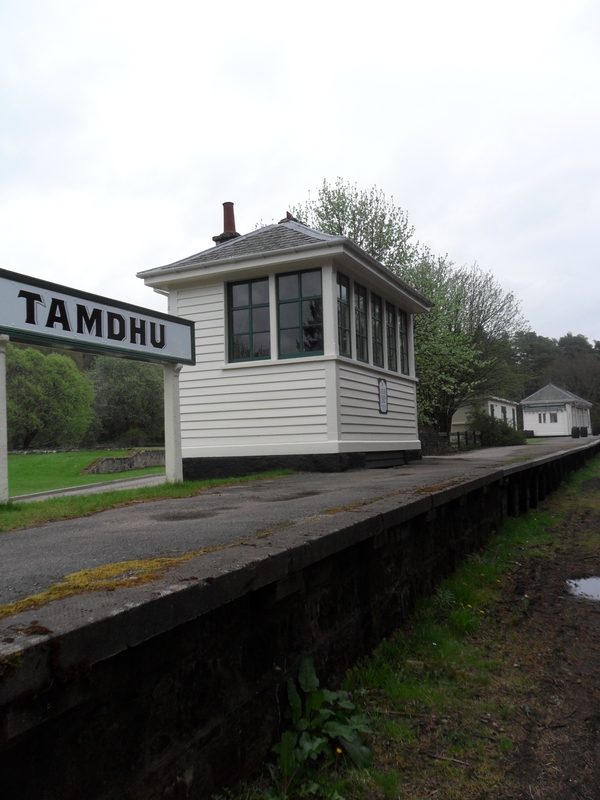 The railway originally started in 1863 and linked Aviemore to Forres. This line was heavily used by the whisky distilleries that set up beside it. Beeching closed the passenger line in 1965. Goods continued till 1968. 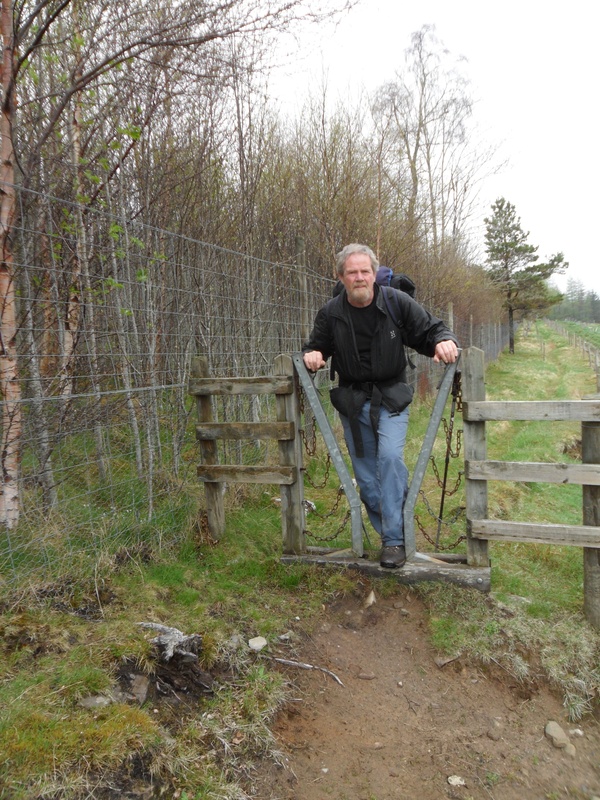 The well graded route gives good walking and we were soon on the outskirts of Grantown crossing the Spey on an old bridge. The morning had been rather dull but as we walked up into town the rain started, fortunately we soon reached the welcoming Chaplin cafe. Too cold for ice cream but we had lovely toasties and pots of tea whilst we dried out. Forcing ourselves to leave we braved the afternoon rain with a superb walk through the Anagach Woods. 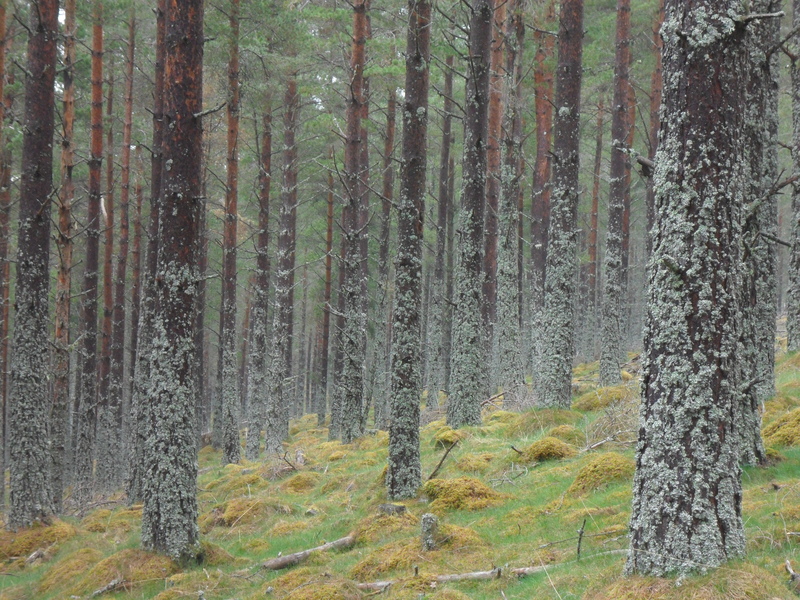 These woods are home to the Capercaillie but of course we never saw any. 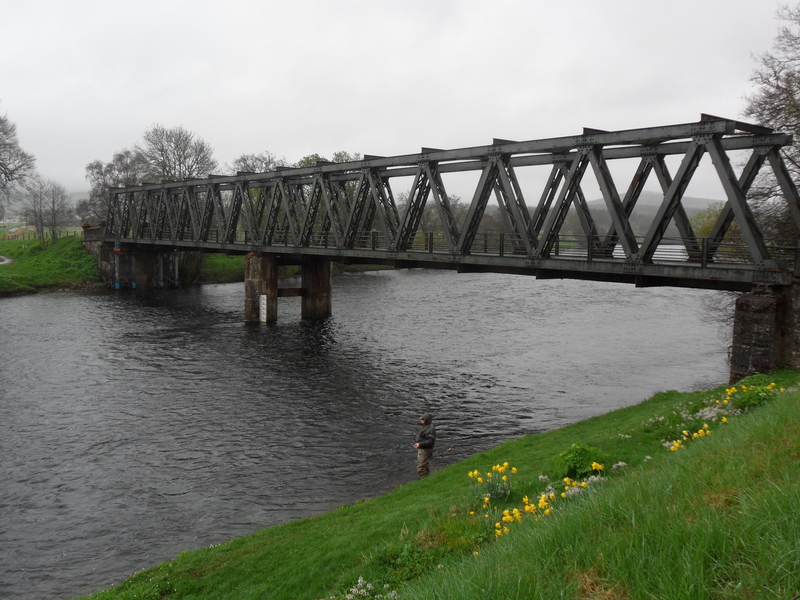 Crossing the Spey by a metal bridge we see an enthusiastic fisherman casting in the river, no doubt at great expense. Past the old picturesque Cromdale station …..
……and soon we were in the unpretentious but friendly Haugh Inn in Cromdale. What a great little hotel. 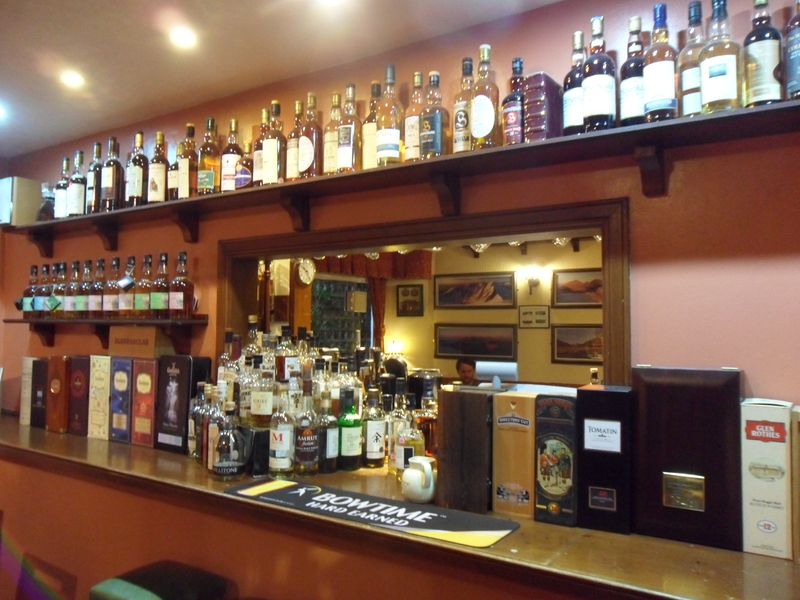 Good room, good food, friendly staff from the Wirral and a fine selection of beers and whisky. Whilst Mel sampled the Windswept 6% Dark beer from a new micro brewery I started on the single malts from the Spey we had walked so far.